Aitor Karanka was happy with his Nottingham Forest side’s performance as they beat Sheffield Wednesday 2-1 on Wednesday night - but felt it should have been a more comfortable victory. Goals from Lewis Grabban and Joao Carvalho earned the three points, Steven Fletcher’s late goal giving Wednesday hope. But overall Karanka was pleased with what he saw. He said: “I’m really pleased but I could have been even happier because we should have won this game much easier with the chances we had. “We knew we had to take another step forward tonight after Saturday’s performance and I think we did that. “I said after the Swansea game that I was really confident about the future because that game showed how well we can play. Tonight, when playing at home, we’ve controlled the game and we’ve had the first and last chances against a very good team. Grabban opened his Forest account with the first goal of the night and Karanka said he has always retained the utmost belief in his striker even though he had taken a while to get off the mark. He said: “I said three or four days ago that he is the best striker in the league and I didn’t have any doubts when I signed him. I’ve known him for five years and I know how good he is. He showed his quality tonight and his performances will only get better from here. Grabban, meanwhile, was thrilled to get off the mark. He said: “It means a lot. It can get a bit frustrating but it is still early doors. It is my fifth start this season, we are still gelling but I am happy to get on the scoresheet. “It didn’t weigh on my mind. If I was getting 10 or 15 chances a game then I would be bothered about it, but I think the team is gelling, we created a lot more chances and Joao was able to get a goal and so was I.
Grabban felt the overall performance was good from the team and that they built on the positive display at Swansea at the weekend. He said: “I thought it was a good performance and we progressed from the game at the weekend. We stepped it up a gear against Sheffield Wednesday and I thought it was good. “There are still levels that we can rise to but as a whole I think it was good and the most important thing is that we got the three points. 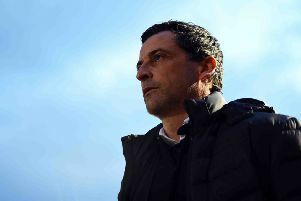 “We learned a couple of things at Brentford, as we are going to do over the season, but I think today we put a lot of good things together and that enabled us to win. “There are goals and assists in this side and today we showed that we can battle hard.